A-Day is tomorrow. For those of you that aren't familiar with A-Day, it is the spring football game for Auburn and Alabama. For us, it is a great excuse to test out some new tailgating recipes and see our football friends. 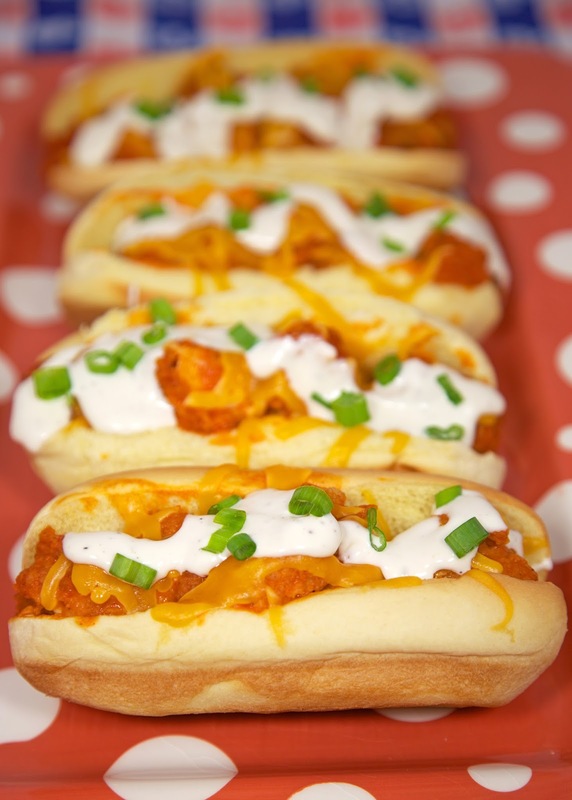 These Buffalo Chicken Bird Dogs are a variation of our original Bird Dogs that we made during football season last year. They are so simple to make and can even be assembled in the parking lot. The only special equipment you would need is a kitchen torch to melt the cheese. The great thing about using the torch to melt the cheese is that it also heats up the chicken tenders. 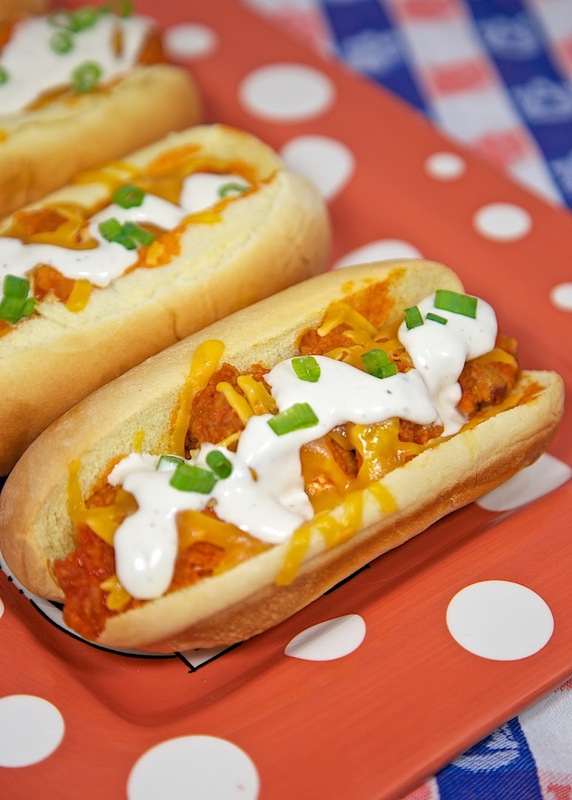 These Buffalo Chicken Bird Dogs are great for lunch or dinner. They are a fun way to eat a chicken sandwich. One note - I used Martin's Potato Rolls for this recipe. I adore Martin's Potato Rolls. They are the best! If you can find them, I highly suggest using them. For each Bird Dog: Chop chicken finger and dunk in buffalo sauce. Place chicken in hot dog bun. Top chicken with 2 Tbsp cheese. Melt the cheese with kitchen blow torch or under the oven broiler. Top with 1 Tbsp Ranch dressing and some chopped green onions. This looks really good - it's making me hungry!! I'd definitely eat a few of those at a tailgate! I'm not a big Vol fan but I'll be going down to the Spring game next weekend and tailgating with our friends from Dead End BBQ and Championship Smokers. I might even make it inside of the stadium, lol.